Traumatic dental injuries (TDIs) and malocclusion are the most common conditions affecting the esthetics during the mixed dentition period of children. The objective of the treatment should be conservative, economical, and comfortable to the patient, with satisfaction being the major treatment outcome. The purpose of this report is to describe the conservative management of TDI using calcium hydroxide apexification technique in a boy aged 9 years, along with correction of midline diastema and anterior crossbite by a removable appliance incorporating a single finger spring, Z-spring, and posterior bite plane, respectively. In the contemporary generation, esthetic has an essential role in the social wellbeing of individuals irrespective of age. The harmony of esthetics is affected in children and adolescents due to several factors the major being the traumatic dental injuries (TDIs) and malocclusion. The TDI is common among the children and adolescents, with a prevalence of 17.5%, boys being predominant gender and fall injury as a major cause. In India, the prevalence of malocclusion and TDI ranges from 19.6% to 90%  and 10.27%  to 30.3%,  respectively. Maxillary midline diastema appears in 97% of children with primary dentition and 48.8% in early mixed dentition phase that signifies its regression with age,  whereas the incidence of anterior crossbite ranges from 4% to 5%. Early intervention, once the diagnosis is made, forms the basis of interceptive orthodontics which in turn is one of the major responsibilities of the pediatric dentists. The most appropriate treatment plan should be the one, which is acceptable and beneficial to the child, correct the condition with as less time and expenditure as possible. 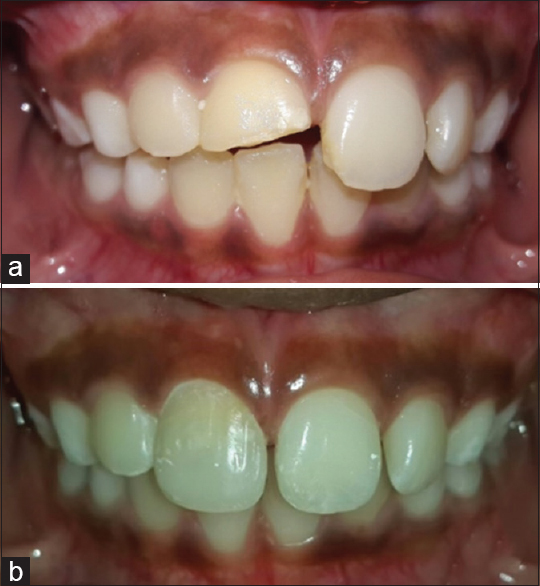 The purpose of this case report is to describe a case of a 9-year-old boy with TDI involving the pulp that was treated economically with calcium hydroxide apexification, along with the correction of midline diastema and anterior single tooth crossbite, respectively, with a removable orthodontic appliance in a period of 3 months. A boy aged 9 years accompanied by his father reported to the Department of Pedodontics and Preventive Dentistry with the chief complaint of broken upper front tooth. On elaborating the chief complaint, the tooth was asymptomatic, fractured as a result of trauma 2½ years ago. The fractured tooth was in crossbite relation and was corrected to position with the tongue blade therapy before the injury occurred as per parent's report. The child was physically healthy with behavior rating 4 on Frankl's behavior rating scale  and without any contributing health history. On extraoral examination, there were no observable abnormalities. Intraorally, the child showed the inter-transitional stage of dental development with a set of 12 primary teeth (canines and primary molars in all the four quadrants) and 12 permanent teeth (permanent incisors and first permanent molars), respectively, with Class I molar and canine relation. The findings included Ellis Class III injury of maxillary right central incisor (MRCI), Class II injury of the maxillary left central incisor (MLCI), single tooth dental crossbite of maxillary right lateral incisor (MRLI), and maxillary midline diastema of 4 mm were observed [Figure 1]. Soft tissue examination revealed the presence of superior/high maxillary labial frenal attachment confirmed by the blanch test. For further evaluation, radiovisiography was advised and interpretations included the presence of nonblunderbuss immature apex of MRCI with a diameter of apical foramen <1 mm. The treatment plan being apexification of MRCI, insertion of a removable Hawley's appliance incorporating "Z" spring and single finger spring for the correction of crossbite of MRLI and midline diastema, and composite build-up of MRCI and MLCI, respectively. Access opening for MRCI was performed, with complete debridement of the root canal and placement of calcium hydroxide paste (R C Cal, Prime Dental Products Pvt. Ltd., Thane, India) followed by sealing the cavity after the placement of cotton pellet and glass ionomer cement [Figure 2]. Maxillary and mandibular impressions were made, and the casts were obtained. The appliance was fabricated using autopolymerizing resin (DPI-RR, Cold Cure, Bombay Burmah Trading Corporation Ltd., Mumbai, India) and the components included right single finger spring for MRCI, Z-spring for MRLI, a short labial bow, and Adams clasps using 23, 23, 21, and 21-gauge stainless steel wires, respectively, along with a posterior bite plane. After the insertion of the appliance, the finger spring was activated, while the Z-spring remained passive during the first and second visits [Figure 3]a. During the third visit, the finger spring was removed followed by the activation of Z-spring [Figure 3]b. Each appointment interval ranged from 15 to 20 days. During the fourth visit, the crossbite correction of MRLI was observed [Figure 4]a and the appliance was discontinued with subsequent obturation of MRCI with gutta-percha [Figure 2]b followed by composite build-up (Tetric® N-Ceram, Ivoclar Vivadent Marketing [India] Pvt. Ltd., Mumbai, India) to MRCI and MLCI [Figure 4]b. The total treatment time taken was 3 months for the closure of the apex of MRCI and correction of midline diastema and crossbite . 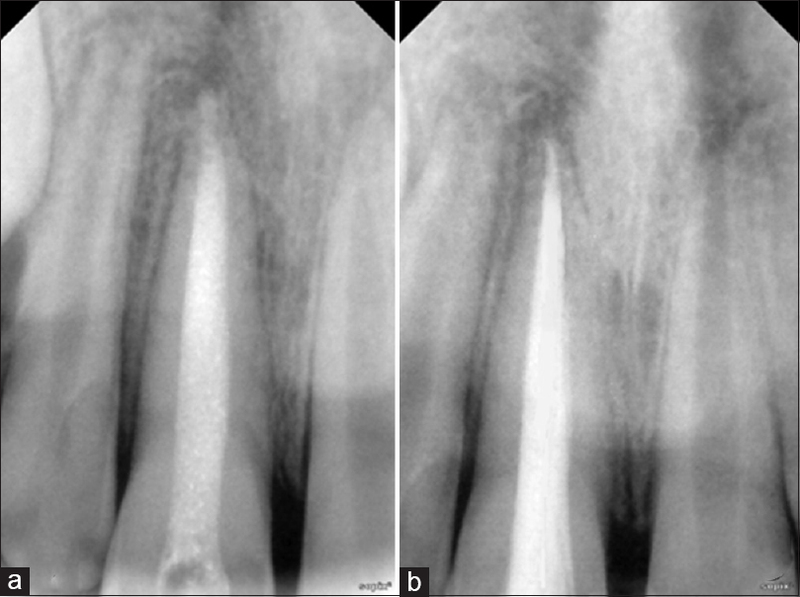 The management of permanent teeth with incomplete root development presents a unique challenge, particularly those teeth with compromised pulpal integrity. A serious complication of these traumatic injuries is the pulp necrosis whose prevalence varies with the type of trauma from 1% to 6% for crown fractures to nearly 100% for intrusions. Pulpal status and the stage of root development are the major factors in the selection of a treatment plan. , The number of visits required, risk of root fracture, the extent of pulpal damage, restorability of the tooth, finances, and patient preferences are factors that should be considered during treatment planning. , Treatment options for nonvital teeth may vary from obturating the immature teeth with modified conventional techniques (Roll Cone technique, reverse cone technique, short fill technique) to obturation after creating the artificial barrier (calcium hydroxide apexification, apical plug technique) and regenerative endodontic procedures. In the present case, as the diameter of apex was <1 mm, traditional calcium hydroxide apexification was performed. In the present case, the midline diastema developed due to the high frenal attachment that may be genetically determined as there is a presence of the high frenal attachment and midline spacing in the family for his father and elder brother. The crossbite of MRLI developed due to the inadequate space caused by proclination of MRCI. Owing to the definite positive compliance of the child, the aim in using the removable appliance with the finger spring was to create space needed for the correction of crossbite. The child is kept under observation until the eruption of canines to evaluate the remaining midline diastema after which the necessity of frenectomy will be determined. The approach to a case such as this, needs a multidisciplinary management, however, the presented case did not warrant expertise of an orthodontist and could be managed in the Department of Pediatric Dentistry. Azami-Aghdash S, Ebadifard Azar F, Pournaghi Azar F, Rezapour A, Moradi-Joo M, Moosavi A, et al. Prevalence, etiology, and types of dental trauma in children and adolescents: Systematic review and meta-analysis. Med J Islam Repub Iran 2015;29:234. Das UM, Venkatsubramanian, Reddy D. Prevalence of malocclusion among school children in Bangalore, India. Int J Clin Pediatr Dent 2008;1:10-2. Singh G, Garg S, Damle SG, Dhindsa A, Kaur A, Singla S. A study of sports related occurrence of traumatic orodental injuries and associated risk factors in high school students in North India. Asian J Sports Med 2014;5:e22766. Murthy AK, Mallaiah P, Sanga R. Prevalence and associated factors of traumatic dental injuries among 5- to 16-year-old schoolchildren in Bangalore city, India. Oral Health Prev Dent 2014;12:37-43. Gkantidis N, Kolokitha OE, Topouzelis N. Management of maxillary midline diastema with emphasis on etiology. J Clin Pediatr Dent 2008;32:265-72. 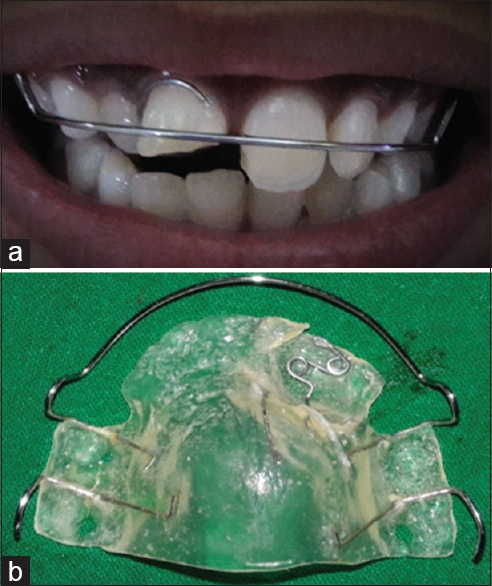 Asher RS, Kuster CG, Erickson L. Anterior dental crossbite correction using a simple fixed appliance: Case report. Pediatr Dent 1986;8:53-5. Clinical Affairs Committee-Behavior Management Subcommittee, American Academy of Pediatric Dentistry. Guideline on Behavior Guidance for the Pediatric Dental Patient. Pediatr Dent 2015;37:E57-70. Andreasen FM. Pulpal healing following acute dental trauma: Clinical and radiographic review. Pract Proced Aesthet Dent 2001;13:315-22. Torneck CD, Torabinejad M. Biology of the dental pulp and periradicular tissues. In: Walton RE, Torabinejad M, editors. Principles and Practice of Endodontics. 3 rd ed. Philadelphia: Saunders; 2002. p. 4-26. Rosenberg PA, Schindler WG, Krell KV, Hicks ML, Davis SB. Identify the endodontic treatment modalities. J Endod 2009;35:1675-94. Andreasen JO, Andreasen FM. Textbook and Color Atlas of Traumatic Injuries to the Teeth. 3 rd ed. St. Louis, MO: Mosby; 1994. p. 159-71, 366-72, 383-425. Swift EJ, Trope M, Ritter AV. Vital pulp therapy for the mature tooth - Can it work? Endod Topics 2003;5:49-56. McEvoy SA. Rapid correction of a simple one-tooth anterior cross bite due to an over-retained primary incisor: Clinical report. Pediatr Dent 1983;5:280-2. Koora K, Muthu MS, Rathna PV. 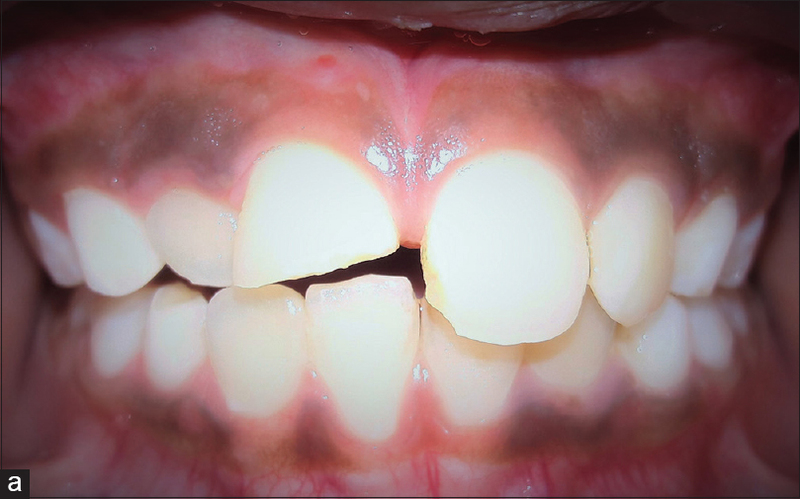 Spontaneous closure of midline diastema following frenectomy. J Indian Soc Pedod Prev Dent 2007;25:23-6. Gass JR, Valiathan M, Tiwari HK, Hans MG, Elston RC. Familial correlations and heritability of maxillary midline diastema. Am J Orthod Dentofacial Orthop 2003;123:35-9. Huang WJ, Creath CJ. The midline diastema: A review of its etiology and treatment. Pediatr Dent 1995;17:171-9.